A new NBC News/WSJ poll finds that 71% of Americans support President Trump's deal with Sen. Chuck Schumer and Rep. Nancy Pelosi, which tied Hurricane Harvey relief to raising the debt ceiling for three months, instead of Republican leaders' preferred 18 months. 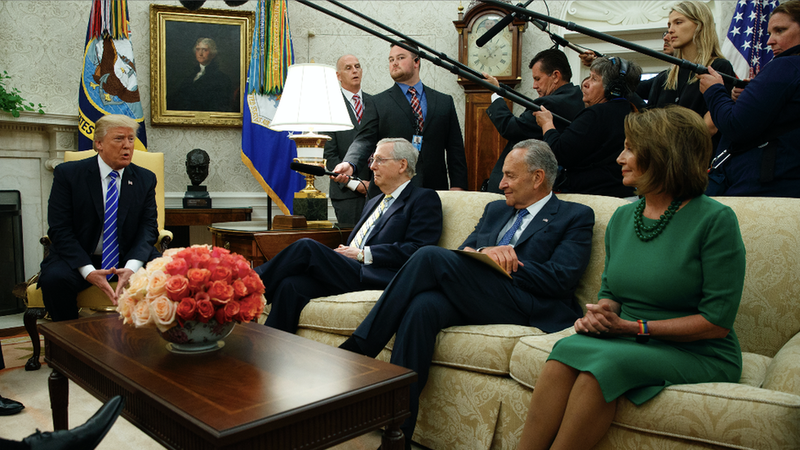 Why it matters: Republicans on the Hill were floored by Trump's decision to side with Democrats, but his voters seem to approve of the president's bipartisan negotiation. Trump's overall approval rating is 43%. His approval ticked up amongst all parties: Since August, approval of Trump's performance rose to 83% of Republicans (from 80%), 41% of Independents (from 32%), and 10% of Democrats (from 8%). Fewer than 30% of Americans support Trump's Twitter use and how the president has handled health care legislation and race relations after the violence in Charlottesville, Virginia.